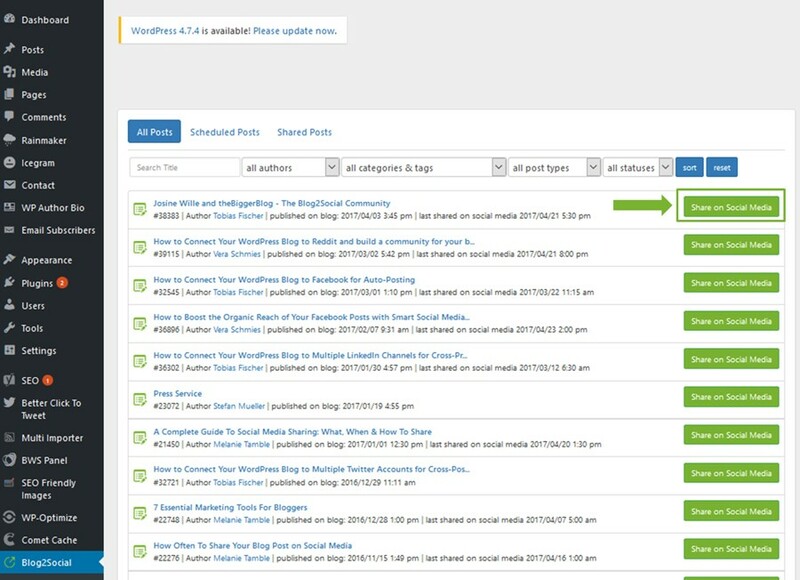 Blog2Social - Schedule post to social media like Facebook, Auto-post to Facebook, share blog posts to Facebook, Twitter, LinkedIn, google+, Instagram, PinterestHow to auto post to Instagram? How to auto post to Instagram? Sharing your blog post with images on Instagram, can significantly increase your engagement rate and blog traffic.To automatically share your images and schedule your image posts to Instagram, can help you to save time and cumbersome manual work. However, Instagram was not designed for auto-posting or uploading images from your PC or blog. And, Instagram has a severe posting policy you should stick to. Learn how to share your images on Instagram with links to your blog post to get more outreach and visibility for your posts and how to auto post to Instagram with Blog2Social. Why sharing your images to Instagram? Instagram is among the fastest growing social networks and has a huge and diverse community of 700 million active users. And, simply put, images are more interesting than text. OK, OK - exceptions proof the rule. But, studies show that images generate more likes, comments, shares and clicks than other post types. That’s because images stir up emotions like no other medium. And therefore, our brain processes visual content more easily than plain text. So, if you want to leave a lasting impression, share your blog images on Instagram! Images, pictures and graphics stay longer in our memory - and they are connected to the text or blog post they has been shared with. So, images are not just a real eye catcher, but help your readers to remember your content more easily. And, if you share your blog posts URL with your images, pictures or graphics on Instagram, you drive more traffic to your blog post and increase your overall outreach. It can make sense to select other images than the featured image to promote your post. Especially when your blog post contains more than one image. Post all shareable images and graphics of your blog post over several days and vary between the comments and hashtags. And, the same applies for the re-sharing of images and graphics. This makes your feed look more diverse and engaging. Plus, it gives your shared images a more personal and introducing touch. 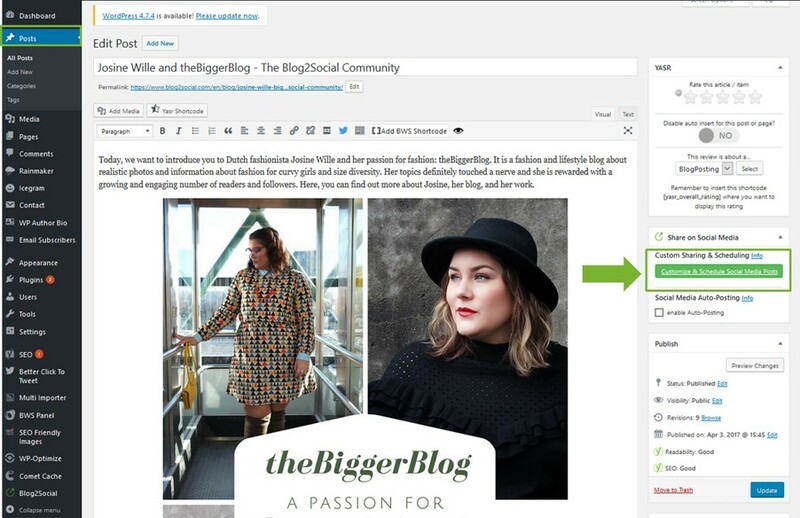 Additional, you can extend the lifetime of your blog content by sharing various images of the same blog post. However, manually sharing your posts across all your Instagram profiles can be quite time-consuming. Therefore, when connecting your blog to Instagram for auto posting, make sure to apply a plugin which enables you to add different images to your Instagram posts and schedule them for the best times to auto post on Instagram. Like mentioned before, Instagram has a very severe SPAM policy. The SPAM filter does notice things that are hard or unusual to do from the phone. Do not post more than you would do if you did it manually. And schedule your post at times that are not uncommon for postings. So, if you post 5 posts per minute and you post around the clock, your account will most certainly become suspicious. Instagram does not support links at all. You can put an URL to your description, but it won’t be clickable. However, Instagram seem to suspect shortened URLs. Posts with shortened URLs are more likely to be considered as spam. Instagram also considers posts with most popular tags as suspicious. So, Try to make your #hashtags more unique and mix popular #hashtags with more specific #hashtags. If you already got hit by the Instagram SPAM filter, make several manual posts from your phone and share your images without any links or hashtags. Engage with your friends and followers. As soon as your account is considered human, Instagram will deselect your account as “spam” after some time. Blog2Social helps you to avoid spending the majority of your working hours with manually posting images to Instagram. You can select individual images, vary your hashtags and schedule your posts at different times and auto post to Instagram. 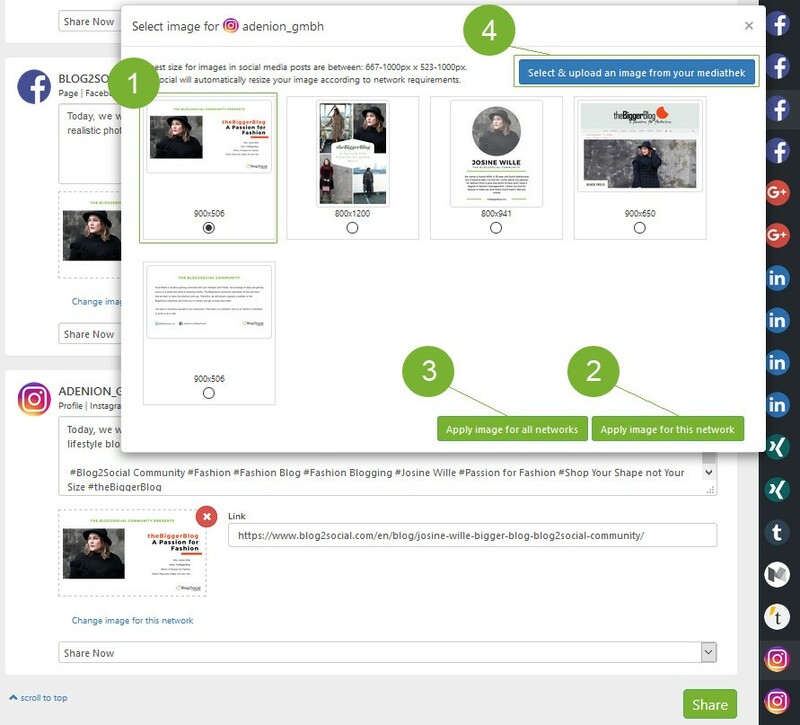 You can set up your entire Instagram promotion within a couple of clicks. 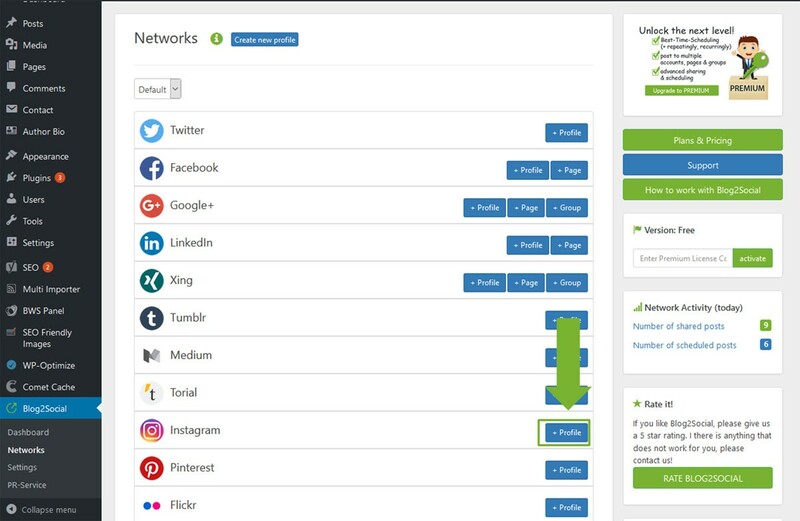 To connect Blog2Social to Instagram for auto posting, please go to "networks" within the Blog2Social Dashboard. 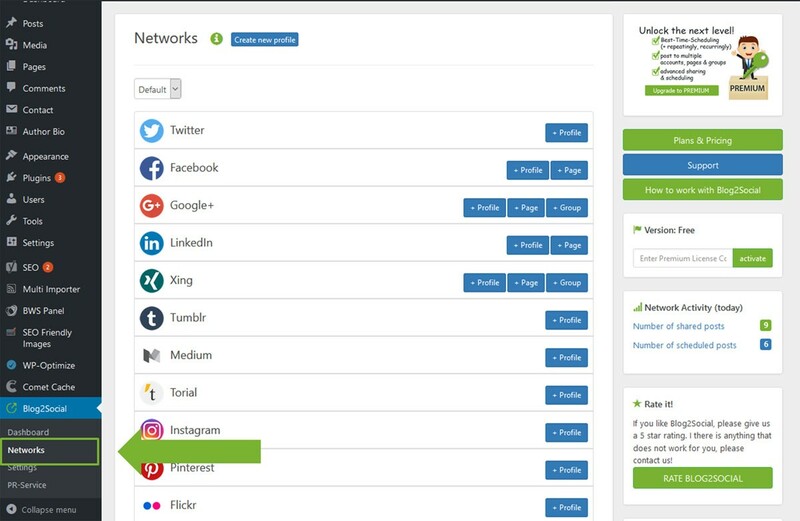 Here you find an overview of all the networks you can connect to Blog2Social. To auto post to Instagram, please click on "+ profile". 1) You may be prompted to enter a security code to confirm your account. 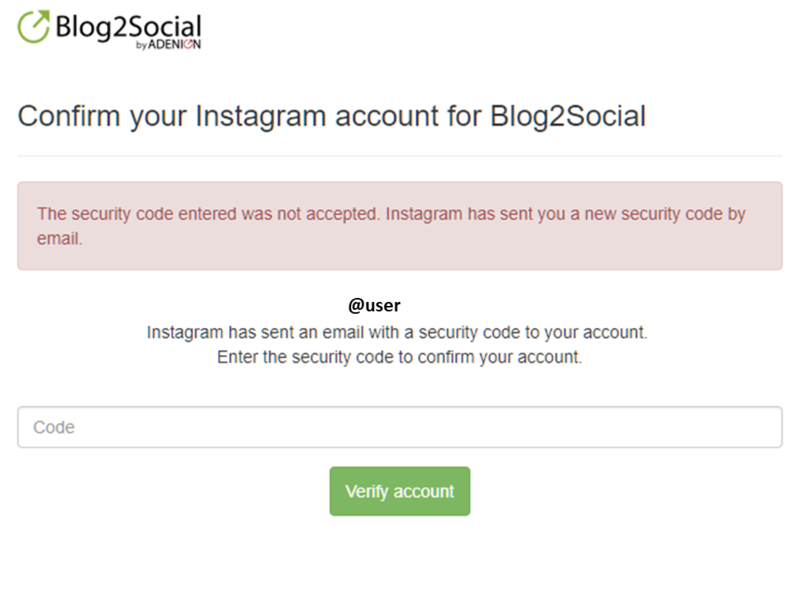 Instagram will send you an email or SMS with a security code for your e-mail account. Please, copy and paste this code into the Blog2Social popup window for the security code and click ‘confirm’. If you don't receive the code, please note that the email with the code is sent out by instagram. Please check your email in the instagram app to see whether it is the right one. Make sure that your email is verified and you can receive other emails from instagram. Please also take a loot into your spam folder to see whether it might have landed there. 2) If you have clicked on “confirm” but your account does not appear among your connected networks, please log into your instagram account. 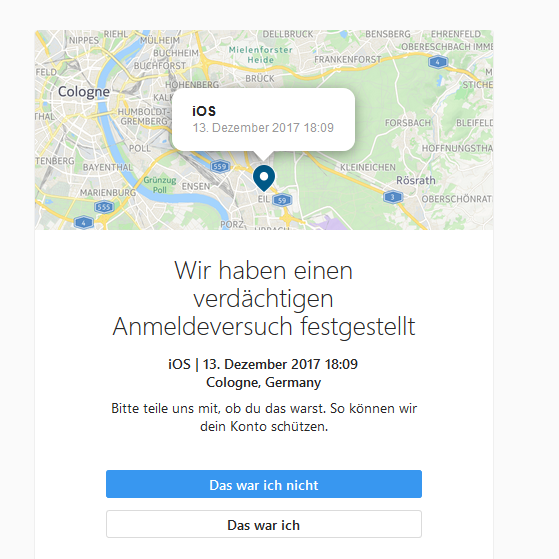 You may receive a message saying that Instagram detected “suspicious login attempts” from the Blog2Social server based near Cologne, Germany. Solution: Please, confirm “This was me”. This is important to receive a new verification code and successfully connect to Instagram. 3) If you successfully connected your Instagram account but still receive the following error message: “Your limit has temporarily been reached for this network. Try again later.”, you may have shared too many posts in short succession. Please note that Instagram has released new security standards for the frequency of posts and does not allow posts in short succession. Solution: Wait for about 1 - 3 minutes between posts in order to share your images successfully on Instagram. Log out of any current Instagram sessions. If you encounter any notifications and can’t connect Instagram as shown in the FAQ, please follow these steps exactly. Extra-Tip: You can auto-post to Instagram, whenever you publish or update a post, or you can select individual images for Instagram, edit your comments and schedule your post. To do so you have two different options. When you are done with editing your blog post, you can click on “Custom Sharing and Scheduling” in the right sidebar of your WordPress editor. 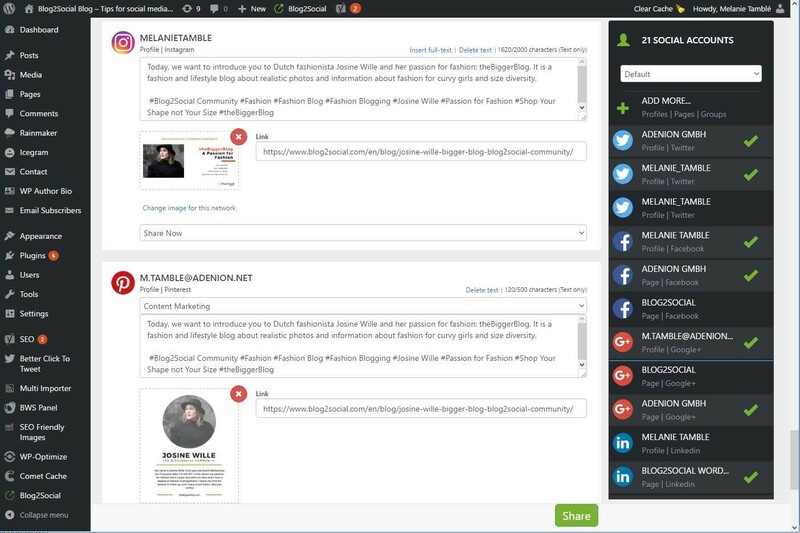 Or you can go to your Blog2Social Dashboard, select “Posts & Sharing” and select your blog posts you want t to share. Both options will lead you to the Blog2Social one-page preview editor, where you can customize your posts for each network, select individual images for each post and schedule your social media posts.To change the featured image and select an individual picture to go with your blog post, simply click on the images frame and a pop-up window will open. How do I connect Blog2Social with my Facebook profile? How do I connect Blog2Social with my Facebook page? How do I connect Blog2Social with my Google+ profile? How do I connect Blog2Social with my Google+ page? How do I connect Blog2Social with Google + groups? How do I connect Blog2Social with Instagram? How to connect my blog to Facebook for auto posting? How to automatically re-publish blog posts on Bloglovin’ ? How do I connect Blog2Social with Facebook groups? How to connect my blog to VK for auto posting? How do I connect Blog2Social with Pinterest? How do I connect Blog2Social with Reddit? How do I connect Blog2Social with my LinkedIn page? How do I disconnect one of my social network? How do I connect Blog2Social with Tumblr? 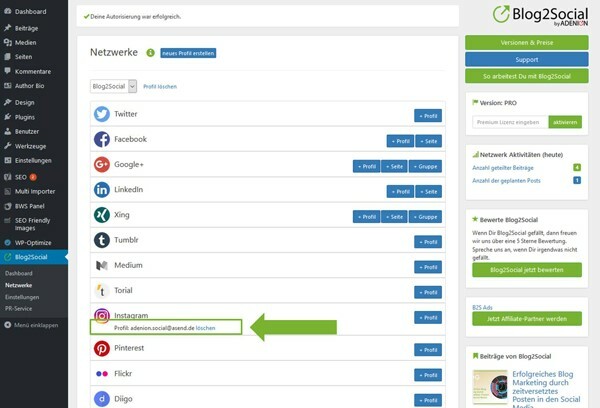 How do I connect Blog2Social with Diigo? How do I connect my Blog with my Facebook page? I cannot connect Blog2Social to Facebook groups, why? How do I connect Blog2Social with my LinkedIn profile? How do I connect Blog2Social with Medium? How do I connect Blog2Social with Torial? How do I connect Blog2Social with Flickr? How do I connect Blog2Social with Delicious? How do I connect Blog2Social with my Twitter profile?